Biotechnology and healthcare industry is experiencing a significant demand from emerging economies across the globe. The report includes extensive analysis on the historic data across the biotechnology and healthcare segment and forecast for the anti-venom market considering all possible factors impacting the growth. The main factor driving the anti-venom market is the anti-venom treatment being the only standard treatment for snake bite with no alternative treatment. Other factors that support growth of anti-venom market is high prevalence of snake bites, scorpion bites, and other animal or insect bites such as fish stings. Encroachment of forest lands for agricultural and housing purposes has enabled human to be in close proximity to poisonous insects and animals, thus increasing the demand for anti-venom which is most effective treatment for venomous bites. Continuous research and development to provide innovative drugs and treatment for animal or insect sting has boosted the development of the anti-venom market. High demand for anti-venom Asia Pacific, Middle East & Asia, and Latin America has attracted regional manufacturers for anti-venom development. Increasing demand for anti-venom in developing countries has led to presence of key players in countries like India and Africa, offering anti-venom products at affordable price. The developing global economic conditions create a huge opportunity for the expansion of the anti-venom market. The rise in individual per capita incomes is bound to increase the spending on health care. In the developing countries of Asia Pacific and Middle East, growing population and per capita income are important drivers of the market. According to economist intelligence unit (EIU), the number of high-income households are estimated to be around 540 million by 2019, out of which Asia Pacific is likely to contribute a share of more than 50%. Region wise global anti-venom market is segmented into five key regions, namely North America (NA), Europe, Asia Pacific (APAC), Latin America (LA), and Middle East & Africa (MEA). Middle East & Africa leads the global anti-venom market followed by Asia Pacific due to presence of highly poisonous snakes in many countries like India, South Africa, Nigeria, etc., which report to have highest death rate due to snake bite. India and South Africa recorded with significant market share in the anti-venom market. India holds dominant position in Asia Pacific anti-venom market accounting to about 50% of the total annual snake bites occurring worldwide, as reported by WHO, thus attracting anti-venom manufacturers in the region. Based on anti-venom type, anti-venom market is segmented into monovalent and polyvalent anti-venom. While based on product type anti-venom market is segmented into snake anti-venom, scorpion anti-venom, spider anti-venom, and other anti-venoms. The market for anti-venom is majorly driven by polyvalent segment. Snake anti-venom segment holds the largest market for anti-venom, owing to high prevalence of venomous snake bites causing high rate of mortality and morbidity without anti-venom treatment. Anti-venom market is further segmented by distribution channel into four main categories i.e. hospitals, clinics, ambulatory surgical centers, and other distribution channels. Segment hospital holds largest share amongst the four in anti-venom market. 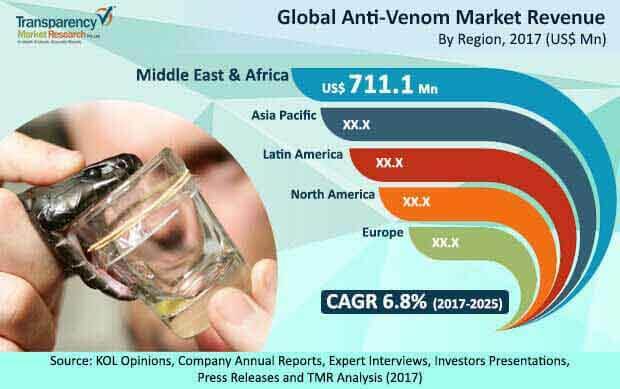 High cost of anti-venom owing to high production cost and lack in availability of essential anti-venom stock worldwide is major concern for growth of anti-venom market. Moreover the snake bite health hazard is listed amongst the top neglected tropical disease. Thus, considering this efforts have been taken on national and international level to increase production of anti-venom to gap the supply for anti-venom demand. The anti-venom market is fragmented, with presence of several large industry players. CSL Behring, Bharat Serums and Vaccines Ltd., Haffkine Bio-Pharmaceutical Corporation Ltd, Vacsera, Vins Bioproducts Limited, Rare Therapeutics, etc. The global anti-venom market is divided into: by transplant type, by anti-venom type, by product type, distribution channel and by geography. Anti-venom type segment was divided into monovalent and polyvalent anti-venom. On the basis of product type, the market was divided into snake anti-venom, scorpion anti-venom, spider anti-venom and other anti-venoms. Other anti-venoms include anti-venoms against fish stings, such as jellyfish and sting rays. On the basis of distribution channel the anti-venom market is divided into hospitals, clinics, ambulatory surgical centers, and others. The market for these segments has been extensively analyzed based on their utility, effectiveness, sales, and geographic presence. Market revenue in terms of US$ Mn and market volume in terms of units for the period from 2017 to 2025, along with the compound annual growth rate (CAGR %) from 2017 to 2025) are provided for all segments, considering 2016 as the base year. The market overview section of the report explores the market dynamics such as drivers, restraints, and opportunities that currently have a strong impact on the global anti-venom market and could influence the market in the near future. Market attractiveness analysis has been provided in all the sections of the report in order to explain the intensity of competition in the market across different transplants/disease indication/applications/geographies. All these factors would help market players to take strategic decisions in order to strengthen their positions and expand their shares in the global market. Geographically, the anti-venom market has been segmented into five regions: North America, Europe, Asia Pacific, Europe, Middle East & Africa (MEA), and Latin America. Each regional market for anti-venom market has been further categorized into major anti-venom type, product type, and distribution channel segments considered within the scope of the study. Key country (U.S., Canada, Japan, Germany, France, U.K., Australia, Canada, China, Brazil, Mexico, India, etc.) market revenues have also been provided in different regional sections within the report. Market revenue in terms of US$ Mn along with CAGR % from 2017 to 2025 are provided for all the regions and nations considering 2016 as the base year. The report profiles key manufacturers in the anti-venom market based on various attributes such as company details, SWOT analysis, strategic overview, financials, and business overview. Major players profiled in this report include CSL Behring, Bharat Serums and Vaccines Ltd., Haffkine Bio-Pharmaceutical Corporation Ltd, Vacsera, Vins Bioproducts Limited, Rare Therapeutics, etc.